Structured Data is a standardized format for providing information about a page and classifying the page content. Google uses structured data that it finds on the web to understand the content of the page, as well as to gather information about the web and the world in general. The goal of adding Structured Data to your pages is to improve your search result ranking in Google. What does it look like on a website? Structured Data is a block of code that appears in the HEAD of certain web content pages. You can see it if you look at the HTML source code of a page where it is rendered. It looks something like the following screen shot. Which page types does it appear on? Structured Data blocks will appear on: Article, Blog Post, Event, Product, and Video templates. What about paywalled vs. non-paywalled content? ePublishing can definitely incorporate that into your Structured Data implementation. The reason it is not part of the standard solution is that paywall logic is nearly always customized for client websites. We must adapt the structured data tagging to match the rules of the particular site. Please note that since part of this solution involves allowing the Google content bot to index paywalled content (via turning the search.engine.request.policy.enabled system setting to true after implementing the paywalled piece), we are not confident that Google will hide content in the Google cache under all circumstances. In the past, crawled paywall content has made it into the Google cache and been available through cache viewing websites. 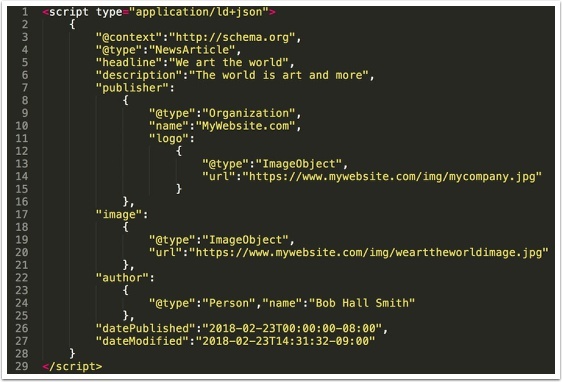 Because Structured Data code blocks are populated by content from our system and it is common for clients to request customizations to parts of the templates listed above, a developer will need to turn on Structured Data and verify that all tags are populated correctly. Some customization may be required to prevent conflicts with existing code. Please contact your Project Manager to schedule your web site's Structured Data implementation. Prev: Search Engine Optimization. Help me understand it.